This past Sunday, June 14, 2015, Pope Francis spoke to the crowd in Saint Peter’s Square at the start of the Ecclesial Congress of the Diocese of Rome. He specifically addressed parents, meditating on three aspects of marriage – vocation, communion, and mission. Marriage and the parenthood it often involves is a vocation, a “call from God,” said Pope Francis. The vocation of married people is to “love one another and transmit life.” Loving and creating within the bond of marriage transforms couples into the image of God “in an altogether special way”. Pope Francis reminded parents that their vocation to love and transmit life requires the daily work of faith and love. He then spoke about marriage as a communion, akin to the communion of the Persons of the Holy Trinity. Communion exists in the Holy Trinity because of the differences between the three Persons, and communion exists in marriage first and foremost because of the difference in gender (sexual difference) between man and woman as husband and wife. Pope Francis called the differences between males and females “riches.” These gender differences that enable communion between spouses also influence their vocation to each other. The vocation of the husband is to “render [his] wife more woman” and conversely, the vocation of the wife is to “render [her] husband more man.” Communion exists fully when husbands and wives help each other grow in their differences. Pope Francis maintained that the complementarity between husband and wife aids their children in recognizing the beautiful differences between the genders. Complementarity also enables parents to help their children grow in different ways, as mothers and fathers often have strengths in differing aspects of life. In continuing to speak about communion, Pope Francis touched on barriers to communion, such as tension between spouses and divorce or separation. He recommended that spouses first of all pray to God when they struggle in their relationship. If separation appears to be the only option, he strongly urged that parents not “use [their] children as a hostage” by speaking ill of each other to their children. The child who hears his father speak with hate of his mother and vice versa learns “the awful way of hypocrisy,” and is prone to speak ill of one parent to another. Even if separation occurs, parents should not speak anything cruel about each other to their children. 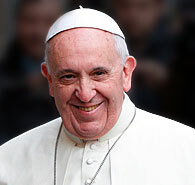 The Holy Father also urged that forgiveness be considered as an option for struggling spouses. Forgiveness allows parents to not only mutually bear each other’s weaknesses, but also be prepared to bear the weaknesses of their children. Finally, Pope Francis spoke of marriage as a mission. Parents are “collaborators of the Holy Spirit,” whose mission it is to hand on their faith to their children. Pope Francis desired that grandparents, who are exemplary missionaries of their families, have “a place of dignity in the family.” The elderly, who make up nearly a quarter of the Roman population, should not be thoughtlessly placed in nursing homes, but should be kept at home with the family for as long as possible.